Rhode Islander's LOVE their pets and we'd do just about anything to have them be happy and healthy. In Newport more than half of all residents are renters, whether they're military families, summer residents here for work or play, college students attending many of our fine universities, or those who live and work on the island year round. In my experience more people have pets than don't. Not surprisingly many, if not most, Landlords have "no pet" policies" due to the damage that is caused in some cases. But that can narrow down the pool of possible renters and cause unwanted vacancies. Many landlords will find themselves working with pet owners in order to fill vacancies, and this blog is about ways you can minimize your risk. Rhode Island law states "A landlord may not demand or receive a security deposit, however denominated, in an amount or value in excess of one month's periodic rent." The Rhode Island General Laws. The phrase "however denominated", is held to mean that whatever you call that deposit, whether you call it "security" deposit, "pet" deposit, "damage" deposit or any other variation, combination or denomination, it can not be in an amount greater than one month's rent. Some enterprising landlords have stretched that limit by interpreting the phrase to mean you can have more than one deposit as long as each deposit is not greater than one month's rent. I have seen no evidence that supports this being a good interpretation. It is my experience and professional opinion that the prudent Rhode Island landlord will require one month's rent, no more, no less, from every tenant as a Security Deposit. The consequences, should your tenant decide to challenge a security deposit in court, are pretty steep. A successful challenge would allow a judge to award the tenant is the amount he was over charged PLUS two times that amount in damages. The tenant can also ask for and be awarded attorneys fees. Scenario: Rent is $1500. Landlord requires Tenant to pay $1500 security deposit, PLUS a pet deposit of $250. If the Tenant should successfully challenge that security deposit in court, the court can award the tenant the $250 he was charged in violation of the Code, plus $500 ($250x2) in penalties, plus the cost of the tenant's attorney's fees which could be anywhere from $300 to $1100 or more. That means the Landlord could be out $800 to $1600 or MORE! If you can't get a huge security deposit, what can you do? Here are a couple of suggestions that might help mitigate your risk to a level that lets you sleep at night and STILL lets your tenant have their pet. 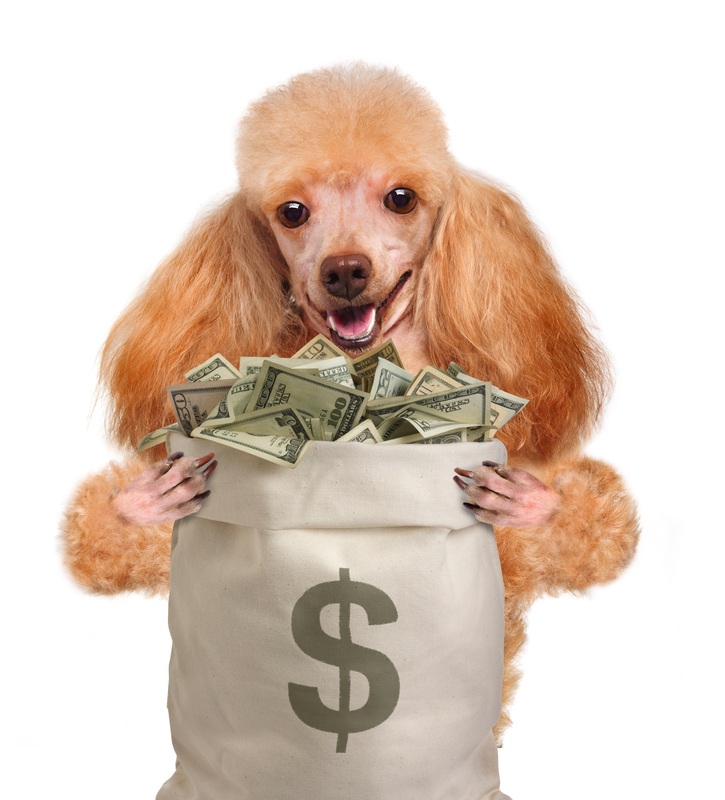 Pet Premium: While you can't charge more than a month's rent in a security deposit, the law does not appear to prohibit a pet premium, or an increase in your rent to cover the pet(s) and any damage. Essentially your tenant is paying you to allow them to have a pet. I have not faced a challenge in court yet nor have I found any indication that a premium is not permitted. The lease should spell out the pet premium and the policy/plan should be discussed in advance with any prospective tenants so they are not surprised. As they say, "sunshine is the best antiseptic". Be honest and upfront about your intentions and you'll head of conflict. Pet Addendum: In addition to your lease you should have a well drafted pet addendum that address both general, common concerns and those concerns that are specific to your property. For example, the pet addendum should identify specifically the pets your tenant has, with the pet's name, breed, and general description. If your tenant will be sharing yard/lawn space with other tenants, you might prohibit a dog from eliminating in the yard, or have a very stringent rule about waste left in the yard. If the tenant is renting a house and is the sole user of the yard, you might include language describing how often the tenant is required to clean the yard from waste and mow the lawn, or you might include penalties that are incurred if your landscaper can't mow due to dog waste. If your tenant has a cat, you can have language that the tenant will sign specifically requiring the tenant to replace, at their own cost, carpets or wooden floors if they have a cat eliminating in the house and outside a litter box. We have a detailed pet addendum that we edit as necessary for the specific property. You can see it HERE. Pet Interview: Take the time to meet the pets your tenant is having at your property. If you have a commercial insurance policy that prohibits dangerous breeds it's important you put eyes on that "Lab Mix" your tenant has. Knowing how friendly, skittish, rambunctious, shy, tiny or HUGE your new four legged tenant is will help you make the right decision for your property. Pets are a great asset to people in terms of providing comfort and companionship. A happy tenant may stay longer which means a steadier income for you the landlord. Most animals will not cause more than minimal damage and your security deposit will cover that. (See Landlords and Security Deposits to learn more about how to use the security deposit to pay for damages).